Lesson idea. This lesson idea involves the use of iPads and the 'Brushes' app (http://www.brushesapp.com) to create digital paintings of flowers. This formed part of the Sheffield Children's Festival (http://sheffieldchildrensfestival.org/school-projects) and was inspired by the artist David Hockney's use of the iPad to produce pictures of landscapes and flowers (http://www.bbc.co.uk/news/technology-11666162). The school was visited by a local artist, Richard Johnson, who ran a series of lessons with the children, demonstrating how to use the Brushes app to produce carefully observed pictures of a range of flowers. This involved sharing digital literacy skills, as well as more general tips relating to the development of painting skills. The children worked individually to produce their pictures. Each child used an iPad, with an 'artist's easel' style stand. 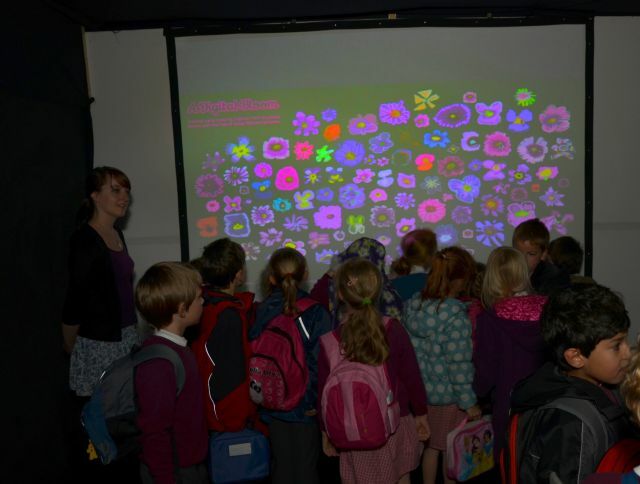 Once completed, the pictures of each individual flower were edited together to produce a 'digital mural', incorporating the work of all of the children. Teaching approach. This activity is a cross-curricular(subject) activity, that gives children to opportunity to work independently on an art activity that also encourages the development of E-skills(topic). This activity encouraged inclusion(ta) as the children's final work was displayed as a collaborative(tool) piece, where all children had the opportunity to make an equal contribution. This page was last modified on 28 September 2012, at 16:13.